I am not a tough gal, however I married an adventurer, so I often find myself in harrowing situations where a certain amount of robustness is required. Needless to say the right gear can make a huge difference between me enjoying adventure rather than me just tolerating it. As we embarked on a trip that would test almost all of my limits, I was incredibly impressed with the comfort and warmth of the boots. 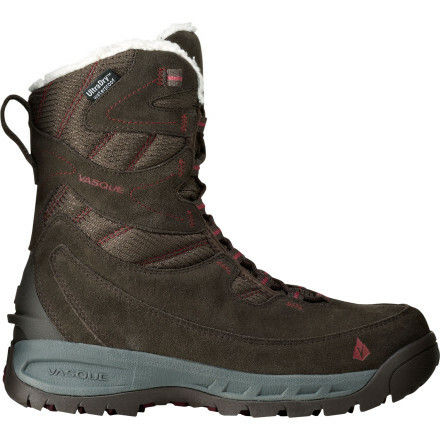 They feature 400g thinsulate insulation, high ankle length, faux shearling ankle border, and a waterproof coated leather body that provided me with toasty toes and blister free ankles and heels on my slightly…ok really challenging journey. At one point during our hike, we found ourselves in 4 ft of fresh snow with a half a mile straight up, before we reached our final destination. I broke trail for the remainder of the ascent and I thought, for sure that my feet would certainly be wet. But to my surprise, when my stocking feet touched the warm ground of the Opus Hut, I was amazed that they were not only dry, but still warm. The boots are easy to get on and off, however I found the laces a tad long as they kept getting caught in my Electra snowshoes, although nothing a handy knife can’t fix. They are solid but not bulky, formed well to my feet, and kept the snow on the ground and out of my boots, leaving my tootsies dry. I did not break them in at all (not recommended) and after what I will call a treacherous snowshoe hike through a ravine-full-of-avalanche-shrapnel, my feet, unlike the rest of my body, were happy as two little clams. I can only imagine what Cameron would have had to deal with if I had blisters to add to my long list of woes. So thank you Vasque, for providing me with a sturdy, comfortable shoe and for sparing my husband. This entry is filed under: Blog, Offyonderette, Review, Snow, Snowshoe. YAY Jordan! Love the review chica!